Three-dimensional open porous scaffolds are commonly used in tissue engineering (TE) applications to provide an initial template for cell attachment and subsequent cell growth and construct development. The macroscopic geometry of the scaffold is key in determining the kinetics of cell growth and thus in vitro ‘tissue’ formation. 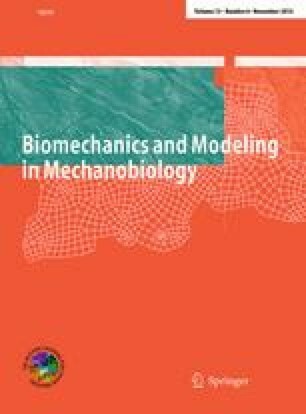 In this study, we developed a computational framework based on the level set methodology to predict curvature-dependent growth of the cell/extracellular matrix domain within TE constructs. Scaffolds with various geometries (hexagonal, square, triangular) and pore sizes (500 and 1,000 \(\upmu \)m) were produced in-house by additive manufacturing, seeded with human periosteum-derived cells and cultured under static conditions for 14 days. Using the projected tissue area as an output measure, the comparison between the experimental and the numerical results demonstrated a good qualitative and quantitative behavior of the framework. The model in its current form is able to provide important spatio-temporal information on final shape and speed of pore-filling of tissue-engineered constructs by cells and extracellular matrix during static culture. Y.G. is funded by Belgian National Fund for Scientific Research (FNRS) grant FRFC 2.4564.12. I.P. is funded by the ENDEAVOUR project G.0982.11N of the Research Foundation Flanders (FWO Vlaanderen). The research leading to these results has received funding from the European Research Council under the European Union’s Seventh Framework Programme (FP/2007-2013)/ERC Grant Agreement No. 279100. This work is part of Prometheus, the Leuven R&D division of Skeletal Tissue Engineering.